After completing this program, the coach will have NCCP Basketball FUNdamentals - “Trained” status. There is no “Certified” status for the NCCP Basketball FUNdamentals program. After completing this program, the coach will have NCCP Basketball Learn to Train - “Trained” status. To be considered for the NCCP Basketball Learn to Train Competency Challenge program, please provide the following information to the Basketball BC Provincial Coach, Shaun McGuinness. If the coach receives approval to proceed with the Learn to Train Competency Challenge program, the Coach Portfolio and NCCP Competency Challenge registration link will be emailed to the coach. 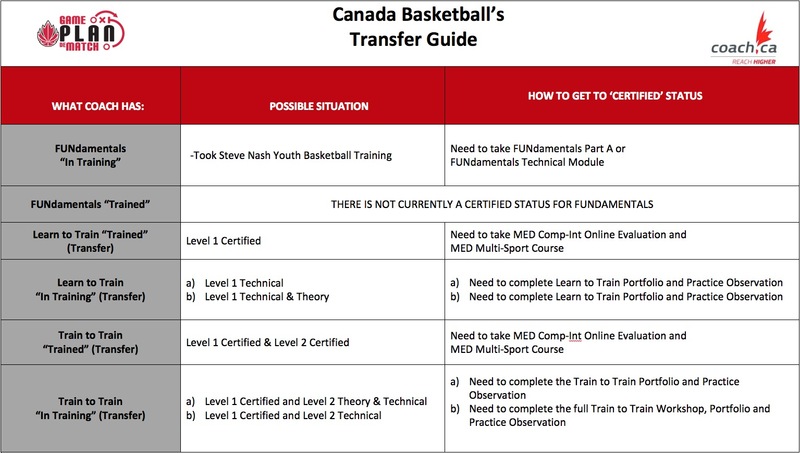 It is recommended that the coach has “Trained” and “Certified” status for NCCP Basketball Learn to Train prior to taking the NCCP Basketball Train to Train course as it is a required for certification. After completing this program, the coach will have NCCP Basketball Train to Train - “Trained” status. If the coach receives approval to proceed with the Trained to Train Competency Challenge program, the Coach Portfolio and NCCP Competency Challenge registration link will be emailed to the coach. each theory module can be completed in person or online through Viasport or the Coaching Association of Canada. It is recommended that the coach who wishes to pursue Competition - Development "Certification" begin completing the Competition-Development Theory modules. For more information on these modules go to http://www.coachesbc.ca/nccp. Please note: coaches do not have to complete the NCCP Learn to Train or NCCP Train to Train programs to take NCCP Train to Compete.